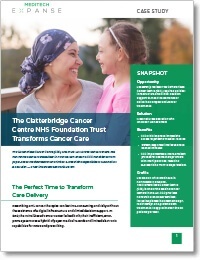 About: Located in northwestern England, The Clatterbridge Cancer Centre (CCC) is one of the leading cancer centers in the UK and has transformed cancer care delivery in the region. CCC provides nonsurgical oncology services, including pioneering chemotherapy, radiotherapy, and proton beam treatments, to approximately 27,000 patients per year. related to the hybrid approach, including cumbersome e-Prescribing, lack of clinical decision support, limited access to patient information, inconsistent documentation, prescription authorization delays, and regulatory compliance issues. Execution: Leadership realized that CCC required a digital infrastructure and clinical decision support to meet the demands of delivering complex anti-cancer treatments. Once LIVE on a fully electronic system, oncology staff across 11 sites could access clinical information, place orders, and administer treatments more effectively. CCC followed MEDITECH’s implementation guidelines by creating a comprehensive program of staff engagement, education, and training, outlined in prototyped clinical stages — each of which required clinical sign-off. By enabling the medical staff to experience the LIVE system in advance, outside of the pressure of their busy clinics, CCC migrated from its legacy systems to MEDITECH’s EPR over a single weekend. Ordering process for chemotherapy requiring multiple cycles reduced from 15 to 90 steps, down to just 8. Clatterbridge’s experience demonstrates that integrating Oncology care into your EPR improves care team collaboration, leading to more efficient cancer care delivery. CCC continues to extract MEDITECH’s rich functionality to help clinicians make better and more timely decisions. Ongoing technology projects will further streamline workflows and reduce clinical administrative time.